Movie Ramble: The Fall of the House of Usher (1928) and Ghosts before Breakfast (1928) with live music by The Southwell Collective. The Fall of the House of Usher (1928) and Ghosts before Breakfast (1928) with live music by The Southwell Collective. RBC Film Club members take their place for Monday night’s film. A cultured and sophisticated evening was obviously the intention of last Mondays RBC Film Club, so it was a real shame it was so boring! The main challenge of my evening was to stay awake; I don’t think snoring would have enhanced the monotonous tone of the music. 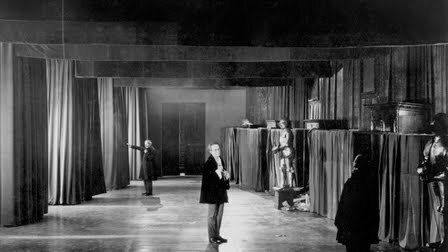 The first part of the evenings entertainment was a short film made by German filmmaker Hans Richter in the 1920s, Ghosts Before Breakfast which used stop-motion animation to create an odd dream that has everyday objects rebelling against their daily routine including flying bowler hats! The second and far longer segment was The Fall of the House of Usher (1928) a French silent film based on Edgar Alan Poe’s classic horror story. The Southwell Collective, who write and performs new music to accompany classic and archive silent films, accompanied both this evenings offerings with specially written scores. The nine-minute short was the more interesting of the two films and was a far superior mix of music and film than Jean Epstein’s House of Usher. I’m the first to admit that silent movies are not my favourite genre, although I did enjoy Phantom of the Opera (1924) at the RBCs 21st birthday celebration in November 2008, which was also accompanied by, live music and the beautifully crafted Piccadilly (1929) starring the very attractive Anna May Wong, a silent film that I would certainly recommend. The RBC Film Club must never stop showing a selection of different films and obviously we are not all going to like every film?